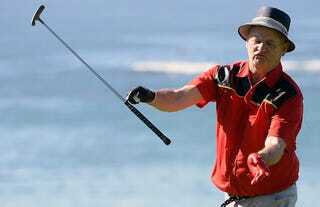 Bill Murray On Cardinals Fans: "Satan's Messengers On Earth"
Famous vagrant Bill Murray played golf in the John Deere Classic Pro-Am at TPC Deere Run in Silvis, Ill. Wednesday, and had fun with fans as he traversed the course. Murray, a well-known Chicago Cubs fan, took as many shots as he could at the St. Louis Cardinals along the way. Murray, wearing a floppy hat and a blue and gold paisley shirt that was perpetually untucked, began bantering with the masses before he took his first swing. He asked if any fans saw his beloved Cubs sweep St. Louis in a double-header Tuesday. One woman behind the ropes said she was a Cardinals fan. “Satan’s messengers on Earth,” was the way Murray described the Cardinals. “And then it turns out your team is cheaters, too,’’ he added. Heh, he’s just joking. Right? Update (3:18 p.m.): WQAD has a bit of footage of Murray trashing the Cardinals and their fans.